The Dog Whispers…Bring Me Home. 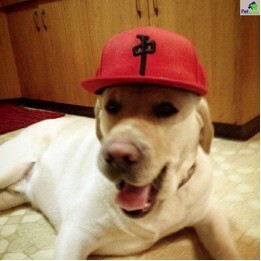 If you are a dog lover, this post may resonate with you if not…well then pretend it’s a cat. My first dog memory was that of a child of about 3. He was an Irish setter/collie cross named Rover and he was my dad’s constant companion. Rover would follow my dad out into the fields trotting behind his tractor. All day. Every day. Since we lived on a farm we always had dogs around. We never had to go to a pet store to buy one since they would often just show up looking lost and confused. People who decided that they no longer wanted that Christmas puppy would drop them off in the spring at the end of our long driveway. It was the late 60’s, their ears weren’t microchipped and they didn’t come with collars and pet rescues were unheard of. We would end up taking them in and it would become Rover’s job to school them into the ways of the farm. There was Rex, Blacky, Lady, Sheila, Carly, Rocko, and Fido. Fido was special. He was mine. He was a little white mutt and he followed me devotedly as I went about my daily chores. He would sleep on my bed at night and race about the farm with me while I pretended I was on some secret mission. I shared my ice-cream with him and all my deepest darkest secrets. Since it was the 60’s, it was not unusual for my 10 year old self and my 7 and 5 year old brothers to be off in some meadow picking flowers and chasing each other through the bush. Fido was always there. Taking in the fun. One day we were about a half mile from home in a ditch picking cattails. I had my doll carriage with me so that I could cart the cattails and whatever other flowers we found back home. Fido would get to ride if he got too tired to walk. That particular road was not a busy one and we would wave frantically whenever someone drove by. But that day the white car that passed was driving too fast to give us a chance to wave. We watched the dust settle as the car roared off. It was then that I noticed Fido laying in the middle of the dusty road. I called him, then walked over to him and nudged him gently with my toe. He looked like he was sleeping peacefully. He wasn’t. The nudge prompted some blood to spurt from his little white nose. I dropped to my knees, cradled him in my arms and bawled. My dear Fido was dead. Just like that. “Fido’s dead.” Her face changed instantly as she ran to comfort me. We buried Fido on the hill. My dad fashioned a little wooden cross and I scratched Fido’s name into the wood. It’s probably there to this day. Even though this happened over 40 years ago, it can still bring a tear to my eye. The pain of that child’s loss seems fresh and becomes mine, once more. I did get to mourn and remember him, however; much worse would have been not knowing what had happened to him. If he had gotten lost, never to return- better to be able to mourn him than to forever wonder. That brings me to the real reason for this post. Two families that I know have recently lost a total of three dogs. Both families live on acreages in the East Edmonton/ Sherwood Park area of Alberta. All three missing dogs were purebred breeds. A yellow Lab, an English bulldog and a Maremma. Their families are heartbroken and desperate to get them back. 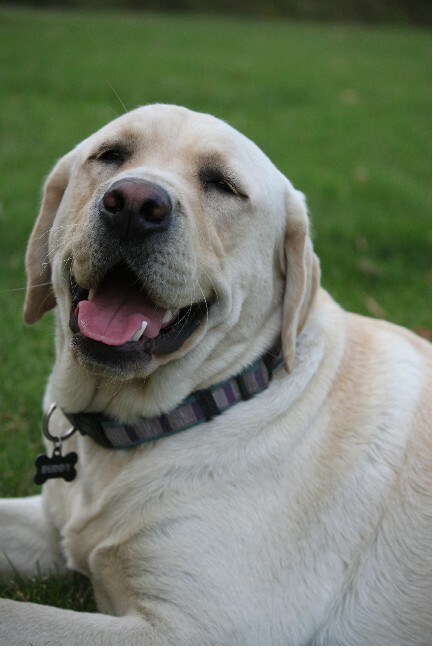 Buddy, a 2 year old male, yellow lab, was wearing a camo collar with tag. He has been microchipped. You may notice him limping since he recently tore his ACL (he was scheduled for surgery a few days following his disappearance). Buddy holds a special place in 12 year old Keghan Baird’s heart. As his mother, Carmel, will tell you if she wanted to find Buddy she only had to call out her son’s name and Buddy would come running. Keghan and Buddy were almost inseparable. However, on that fateful day, Buddy was on bedrest due to his torn ACL; he had been housebound for 5 days when, his boredom got the better of him and he nosed the front door open. It was ~ 2 pm in the afternoon and he wanted to join the other family dogs for a romp in the yard. 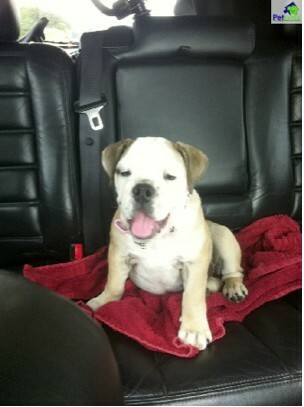 Then we have Maddy, an 8 month old female, tan & white English Bulldog. She was wearing a pink leather collar and was not yet microchipped. 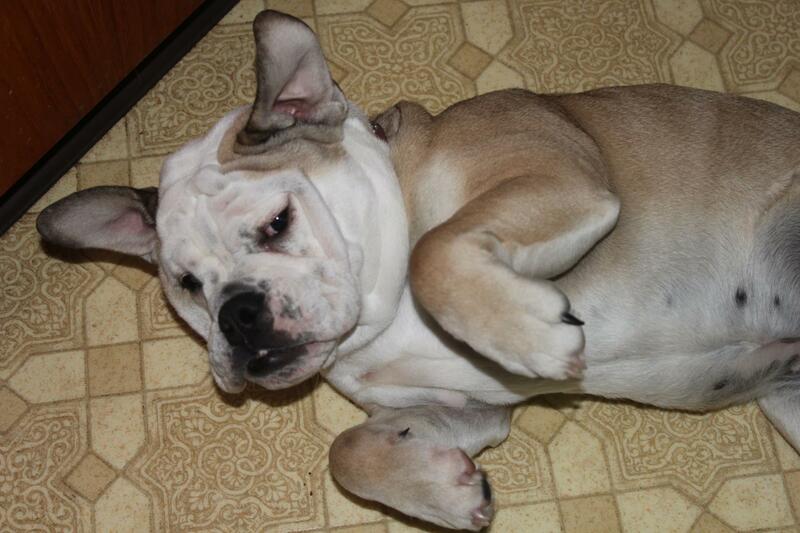 Being a bulldog meant she wasn’t a fan of long walks or marathons. Nope, she was a little lazy and instead of trying to keep up with the other dogs, she’d plop herself down to rest and wait for their return. 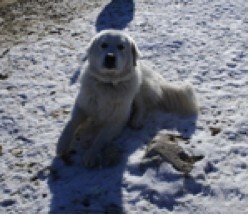 Buddy and Maddy went missing together on the afternoon of Dec. 29, 2012 from their Northeast Edmonton acreage. Both of these dogs were loveable and friendly. Flyers have been posted all over the city and searchers have scoured every bush of their 40 acres but to no avail. Even local and national news coverage has so far not brought them home. It seems very likely that they have been picked up by someone and if they were picked up- they could be anywhere. The Baird’s are asking the public’s help to get them back. They are also offering a reward for their safe return or for any tips that lead to their whereabouts. If you find them or know of someone who may have seen them please contact the Baird’s at 780-964-0927. Next we have the Barr’s. They lost their dog, Rocky. 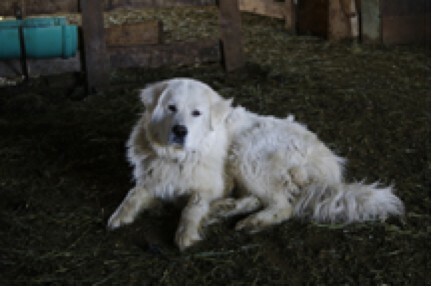 He is a 2 year old Maremma and he has been missing since November 16, 2012 from his Sherwood Park area acreage. His primary role on the Barr’s farm was that of a sheep guardian. He would guard the sheep out in the field so that they could graze peacefully and safely. The year prior to getting Rocky, the Barr’s had lost nine sheep to coyotes. The coyotes would attack almost daily. Once Rocky was on patrol, however, not a single sheep went missing. He is white and was wearing a blue collar. He is only two and has not been neutered. He also still has his dew claws. Rocky is still a puppy at heart and he loves to romp about his yard. The last sign of him were tracks showing that he had crossed the road to the neighbours. He was known to do this on occasion but had always returned. If you see him you can Contact Rick or Amy at 780-416-4958. Dogs become family members and their loss brings real heartbreak and sadness. Of course these are just two families that are searching for their lost companions. There are many other dog-loving families out there that are looking for their pets. So the next time you pass by a ‘Lost Dog‘ poster please take a moment to read it and keep an eye out for all those missing loved ones. Their return will bring back a lot of smiles. This entry was posted in Dogs, Home & Family, Pets and tagged dogs, lost dogs. The reason I’m writing all of this is one I haven’t really shared in more than twenty years. One spring day, Kid found himself a place in the orchard… at first above the ground and then, a few days later, below it. That day, looking at him weakened, still hopeful that his friends were coming home that evening, yet seemingly knowing already what I was just about to understand, I knew it was the day my childhood ended. Donna, I’m sure that both families appreciate your effort in getting the word out. Starting it with the story of your loss (so many years ago but still heart-wrenching) really hit home. If I was still in Edmonton I’d be out looking for the three of them now. I hope there is good news to share very soon. Yes, animals hold such strong connections to us even after they are long gone. Fido will forever be etched in my memory. Let’s hope Buddy, Rocky and Maddy all find their way home soon.